Sometimes tree fungus, or dry, rotted wood called “punk” is mentioned as a spark catcher. The media personality makes a spark somehow, there is a camera angle change, and presto! We have ignition! But in the real world, during an emergency, there isn’t time to search for such specialized items, even if they are available, and even if they do work. Of all the firemaking tools at your disposal, charcloth is one that should be included in every survival kit. It works with every method of firemaking. 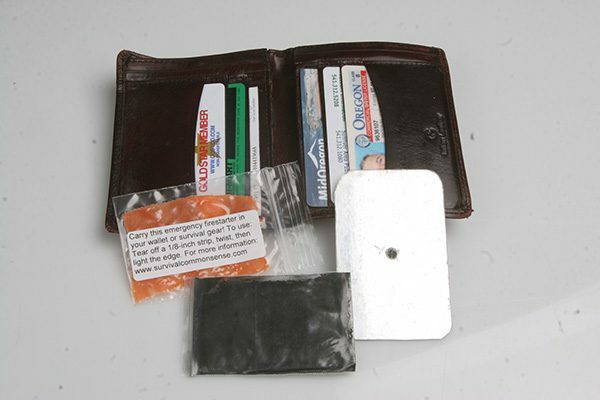 Charcloth, made from old denim, will catch any spark and should be included in every survival kit! The finished product should be completely black, but flexible and not brittle. Charcloth is a material, usually 100 percent cotton, that has been “cooked” like charcoal at high temperatures until it becomes black and flexible. 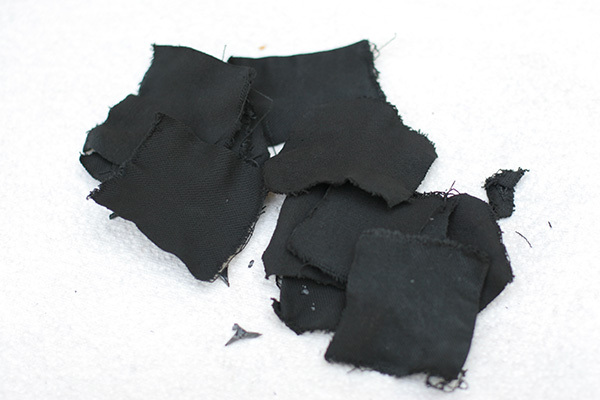 Properly-made charcloth will easily catch a spark from any source and will spread into an ember. A spark can come from a flint and steel, flint stick, broken lighter, jumper cables and battery etc. You could even light charcloth with a damp match that flares but won’t ignite. In fact, if you only have a few matches, (and matches are always a finite resource) your best move might be to light some charcloth. Once caught, a spark on charcloth is virtually impossible to blow out. If the tinder bundle and small kindling are ready, it should only take about a one-inch square of glowing charcloth to get a fire going. Lighted charcloth extinguishes easily with water. But all you have to do is dry the soaked material out and it will work again. You can also try charring some organic materials, such as tree bark (cedar and juniper) and others. Cattail fuzz works well, as does milkweed down in season. There might be a great natural charring material in your area, just waiting to be discovered. It goes without saying that any experimenting should first be done in your backyard!